Because I have room in my battery box (and not everyone does), I always have a battery monitor connected while playing. (see the photo...) It beeps at me should the voltage of the LiPo or LiFePo4 drop below a selected voltage threshold. 2) It is probably cheaper and easier to just buy and carry multiple batteries and switch them out as they start to die. Guns rarely die all of a sudden, and games are rarely non stop firefights. Pay attention to your ROF and switch batteries during a break in the action. You have to do something while waiting to regen after all. This advice is especially true if you have never done a lot of gearbox work. If you are just starting out don't fuss with your gun until it starts acting up. He asked about efficiency and I answered. Look it up for yourself. Silver IS the most efficient metal conductor. Is the difference in Ohms (resistance) negligible in the world of airsoft? Yep, pretty much. About as negligible as using Deans connectors compared to properly installed and undamaged Tamiya connectors. The circuits in airsoft guns are so simple that it really doesn't make that much of a difference, still, he asked how to make his gun the most electrically efficient. If he wants to go out and spend $50 bucks on a roll of silver wiring, silver solder, etc, then who are we to stop him? Silver's presence in solder also has a negligible effect on the resistance found in an AEG circuit. I'd recommend not coating your trigger contacts with any kind of solder since it carries the potential for your trigger switch to weld itself together and create a runaway gun hazard. A solid-state switch would be a much better option. Not if you use a very light coating of solder and wick away the excess. Even better would be to silver plate the contacts, then you wouldn't have that worry. I have done the silver solder trick to AEG's before and have never run into an issue. And yes, a solid state switch, like the relays in Ares AEG's are always the best options, but unfortunately for most people, the internal dimensions of traditional gearboxes prevents this. I've found the startup current drawn by most stock AEGs to be around 25A, after which it settles down to around 18-22A. Using a higher amperage fuse shouldn't hurt anything except it would take a more serious fault to trip it. Come to think of it, the fuse is also a significant source of resistance in and of itself. Older automotive tube-style fuses can create a lot of resistance and lost energy. I've worked on a few setups where the customer had melted the fuse assembly entirely, and that is why I use PTC fuses (polyfuses) in my personal guns. When they trip, they heat up and break continuity momentarily while you correct the issue, and then reset themselves after they're allowed to cool whereas a disposable fuse needs replacement. Blade fuses are a little better than the older tube fuses but not by much. A super-cheap way to find the startup current by using a fast blow fuses. If it's blowing over 20 Amps, then you could be correct. The fuse should flash like an old school flash bulb. This isn't the best way to do it, but it's effective in a pinch. Startup current is highly dependent on several factors though, including the kind of motor you use, the upgrades in your gun (like a stronger spring) and how efficiently you've made installations to those upgrades. For example, screwing up a shim job could add to the friction in the gears, requiring the motor to pull more current to overcome that extra friction in the gearbox. Back in 2004 when I did some current tests using a very expensive Watt Meter, startup current always ramped up from a very low current (around 8 Amps if I remember correctly) then increased to about 15 to 18 Amps, depending on the gun. The guns I tested were all Marui's upgraded to between 350 and 400fps. This multimeter setup was really nice because it could be connected to a computer so that we could chart out exactly what current was pulled and when. Current draw was usually lower at startup than people realize, and draw increased as the spring was pulled back and additonal current was pulled due to the increase in EMF required to turn the motor. As soon as the piston dropped off the sector gear, firing the gun, the Amp draw dropped down to the lowest Current. First-shot startup current may have been slightly more, but any difference between semi and full-auto was insignificant. It definitely never came close to 24 Amps. The only gun I ever tested that went over that ~18 Amp threshold was an old Marui PSG-1 with the mini Ni-Cad pack that people had to use back then. When upgraded to 500fps, the PSG's could pull well over 20 Amps. Their springs were always compressed at startup, and so startup was when the motor would be pulling maximum ampherage. This often led to people buring up their trigger switches on PSG-1's, and was very common. Tell me how you're doing your Amp tests. Terry of Extreme-Fire.com is working on making a watt meter for AEGs that will allow you to measure the amount of current your gun is drawing. It'll be very useful for determining the optimum shimming and wiring configurations but there are also RC watt meters that will do the same thing that are already available. I thought Extreme-Fire had dropped off the face of the planet. Didn't know they were making anything these days. That would be cool if he were to make something for airsoft that measured current. The problem with the RC watt meters is that the displays are not constant and I've never seen one that you could actually gather data over time and export it out in order to chart or view changes in current over time. Every time an AEG cycles, it goes from minimum to maximum current draw ten, 15, 20 or more times every second. Most of the RC watt meters can't keep up because they only take measurements at various intervals. So, when you view the current on the watt meter, the number fluctuates up and down all over the place and didn't provide any constant maximum or minimum. If you know of one that gets around this, let me know and I'll look into picking one up. Overall, I found the cheap RC watt meters to not to be very usable for airsoft due to the changes in load our guns cycle through every second. RC watt meters are mainly used for RC cars, planes, heli's, boats, etc, for determining the constant current draw to determine the best battery to use for a certain model. When a MOSFET starts acting as a point of resistance, it is on the brink of failure or it was assembled improperly. I think you misinterpreted what I was trying to get at. By nature, whenever you add something to a circuit, you're adding some form of resistance, no matter how small. It's not like you're plopping in a bit resistor just by installed a MOSFET. That's not what I was intending to say and I think you have have misinterpreted that. But, MOSFET's are always ON (or at least most are) as soon as they're plugged in, and they do pull a small amount of current from the battery in order to function properly. It is not significant, but there is a small draw there. Uhm, practically every airsoft MOSFET runs low voltage current through the existing mechanical switch. This is how they preserve the trigger switch - by sending a signal through it instead of throwing the full current through it. You can kind of say that yes, they might cause your battery to be depleted slightly faster with a MOSFET, but you'll be able to send more rounds downrange compared to a gun without a MOSFET. Well, "practically every airsoft MOSFET" is not the same as "every airsoft MOSFET", so I'm just trying to differential that all MOSFETs are not created equal (please don't change your AO avatar to a red equal sign and call for equality!). You're preaching to the pastor on this one. Yep, I know how the trigger circuit works on MOSFETs that have them, and yes, it's very low voltage, I think about 1V or less. Regardless, it is not significant. As far as how many BB's you could shoot with a MOSFET and without? That could be a topic of much debate depending on many different factors. MOSFET's gate more Current per shot on average, and they are better suited to adjusting voltage or current to sustain a certain level of performance. Most higher end MOSFET's will simply stop shooting once a Current of Voltage threshold is reached too, kind of like a safety cutoff to protect the battery. Some guns could potentially shoot more or fewer BB's down range with or without a MOSFET. It could depend on the maker and the features the MOSFET has. MOSFET's don't increase battery efficiency. They increase electrical performance, hence my race car analogy in my previous post. You have to use more gas to get an increase in performance, so I'd be willing to bet that a gun with a MOSFET might shoot slightly fewer BB's over time on the same battery pack, but the difference is likely not enough to have any impact on someone's playing style. It all sounds so futile. From my personal knowledge of electricity, adding MOSFETs (or anything that uses electricity) doesn't actually increase electrical efficiency, but the small amount that it sacrifices can be worth it, if you want what a MOSFET can give your gun, like longevity an faster trigger response, and a higher RoF. So, to increase your guns electrical efficiency (the hole in the gas tank analogy was perfect by the way!) you have to reduce the current it draws. Better shims, better lube, higher gear ratio, and a weaker spring, right? More conductive wire will help, but (correct me if I'm wrong) aren't there are other upgrades you can do with a better performance increase/cost ratio? What has experience told you guys about the biggest things you can do to increase efficiency? No. Not reducing load (current drawn), but increasing the quality of the circuit. That will increase the electrical efficiency of the circuit. Think of it like a creek. If there are a lot of rocks in the creek, the water will run more slowly. If there are no rocks, the water can run more directly and faster. So the quality of components and a reduction in electrical resistance (like using Deans connectors), is what matters electrically. Shims, lube, gears, springs, etc, will help reduce the amount of torque required to spin the motor and turn the gearbox. That all has to do with electromotive force, which is an entirely different subject altogether. It saves the trigger contacts, doesn't it? Or does the faster trigger response lower the longevity? Sorry, I guess I'm talking about battery life instead of electrical efficiency... If there's no m150, the motor takes less current to run, which means longer battery life, right? That's the goal here: use less battery power for the same or more shots. I understand and agree with what you're saying though, sorry I didn't make the battery thing clear. You probably don't need an M150 in most AEGs anyway. 350 fps is more than fast enough for most applications and you can use the gun safely at closer ranges. Years ago 350 was th cap for indoor games. A weaker spring means reduced stress on the system and therefore greater battery life and reliability. You can get by without "moar fps." My gun shoots 260 and I do just fine. Anyway, what causes batteries to heat up from use? Mine can get pretty hot by the end of the day. Is this normal? Batteries heat up during charging and discharging due to the internal resistance of each cell in the battery pack. The lower the internal resistance, the more current a battery can deliver and the less it heats up during charging and discharging. Overcharging is an extremely bad thing for any Lithium based battery (LiPo, LiFePo4, etc...) but is necessary when charging a NiMH battery. In a battery pack that is still charging, those NiMH cells that have soaked up as much charge as they can will begin shedding the excess charge as heat; whereas the other almost-full NiMH cells will continue to absorb charge and store it. Overcharging is only recommended at a charge rate of 0.2C or less, above that rate and the batteries will heat up too fast and too high and will be damaged. My charger (MRC SuperBrain 989) includes a thermal probe that I tape onto the batteries that are being charged. It acts as a charge cutoff switch and safety precaution. That's true, but then again, my oldest gun was one I bought in 2000. It still has its original trigger switch and probably has well over 250,000 shots through it. The longevity of the trigger contacts is very subjective. But yes, using a MOSFET with a secondary trigger circuit will practically eliminate arcing and carbon buildup on the trigger contacts and will dramatically improve the life of the contacts. Well, having a more efficient electrical circuit will help to improve battery life, and reducing the amount of internal resistance in the circuit is the only way to improve electrical efficiency. It's just that airsoft guns are so simplistic, that unless you did very controlled testing, you probably wouldn't really notice a difference. Some people claim to notice a big difference, and in some cases I too have noticed a difference on certain guns. But other times, it doesn't seem to help. I used the M150 analogy because it would be a gross exaggeration of an increase in spring strength in an AEG with no other upgrades. A stock Marui AEG spring is supposed to be an M90 equivalent spring. As you increase the spring number (M100, M110, M120, etc), the amount of energy (or Work) required to compress the spring increases. This presents a type of mechanical resistance that works against the motor. The motor then needs to generate more elecromotive force to turn, which requires the motor to draw more electrical current from the battery. This is where it helps to have a more efficient electrical system, so that the heat generated in the battery and wiring is reduced to a minimum. But there are so many factors that can effect the current draw, that we could sit here all day and discuss it. The two biggest things are usually the battery type and quality, and the motor quality and magnet type. But yes, the lower your spring, the lower mechanical forces are going to act on the motor, and the less current it will draw to maintain the same RPM. If you take a motor completely out of the gun and allow it to spin up, it has the lowest amount of draw on the battery. You're most likely exceeding the current load that your batteries can provide in a nutshell. Battery output is a chemical reaction, and when you try to draw a large amount of power from it not only are you feeding an exothermic reaction but the internal resistance of the battery generates heat as well. The more current you pull, the more heat you generate. In batteries with high capacities, such as high C output high milliamphour lipo's, this current is comparatively low since they can output far more than what your gun calls. But in low C NIMH batteries you typically pull close to what they can output constantly, and this causes heat build up. Less stress in the gearbox will increase how long the battery lasts during a game, however there is a limit to how low-powered of a battery you can reasonably use. While its nice that many guns include an 8.4V 1100 or whatever NIMH battery with them, people are often surprise to find that this battery is by far insufficiently powering their gun. People here may have over-complicated the subject. 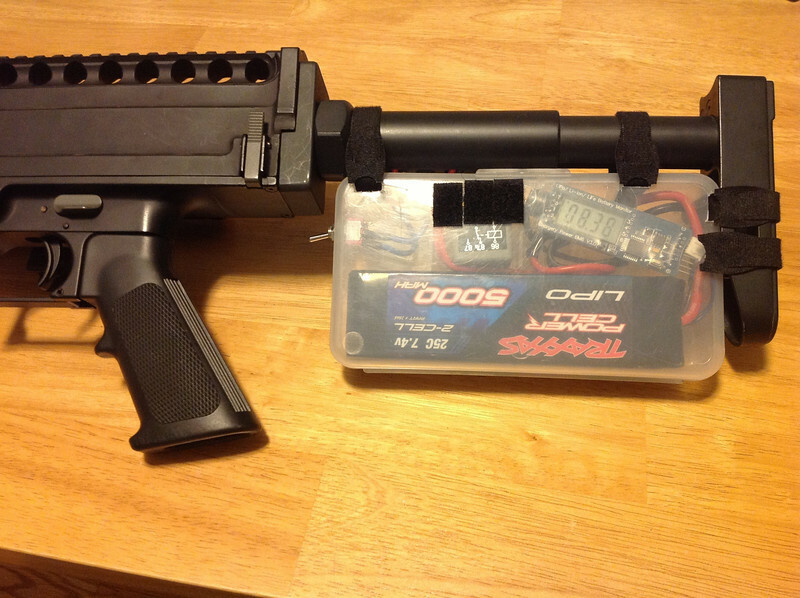 Torque based gears, quality motors, mosfets, and a quality shim job definitely improve efficiency in a gun. They are great things to start tinkering with if you like; however often times just switching to a more performance battery is not only the more economic choice, but the more reasonable if you are not willing to spend the time and money chasing after "perfection." I've found the startup current drawn by most stock AEGs to be around 25A, after which it settles down to around 18-22A. Using a higher amperage fuse shouldn't hurt anything except it would take a more serious fault to trip it. Come to think of it, the fuse is also a significant source of resistance in and of itself. Give up now, I've been saying this for years. Last edited by Spectre; 04-05-2013 at 11:43 PM.